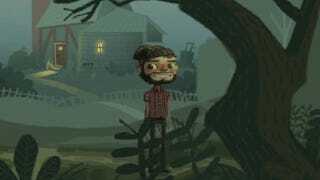 A few hours ago, Double Fine uploaded a clip on Vimeo. It had some interesting imagery in it. Of what looks a lot like the company's new, Kickstarter-funded adventure game. The clip has since been taken down, but reader Corey was quick enough to grab some screenshots. Given the fact I haven't seen the video, we can't confirm if they're just ideas, mock-ups or are indeed actual screens. Assuming they're actual screens, though, how do you think it's looking? I like it. Yet, I don't know why, but I was expecting something a bit more pixellated. UPDATE - OK, seems they're from a video intended for backers of the Kickstarter fund, where Double Fine artist Lee Petty is trying to nail down a visual style for the game. So, it's not nailed down. That being the case: you hear me, Petty? More pixels! UPDATE 2 - Now with video, which to reiterate, is just of Double Fine messing around. So no, your hard-earned money is not going towards a Flash game.